The Colorado Conference is delighted to learn that two of its own– Don Eron and Suzanne Hudson (ret.) of the University of Colorado at Boulder (UCB)– have been selected by the Assembly of State Conferences‘ awards committee as this year’s recipients of the Tacey Award. The Tacey Award is presented to an individual(s) for outstanding service to a conference over a number of years. Don and Suzanne are perhaps best known for their efforts to establish tenure for contingent faculty at public institutions in Colorado. In 2005 they began to work for the establishment of tenure for contingent faculty at UCB. Their proposal closely paralleled the AAUP’s 2003 statement on Contingent Appointments and the Academic Profession. Eron and Hudson held numerous meetings with CU contingent faculty and created “white papers” and other promotional materials to advance their plan. A vote by UCB’s contingent faculty favored their plan by 279 to 29. 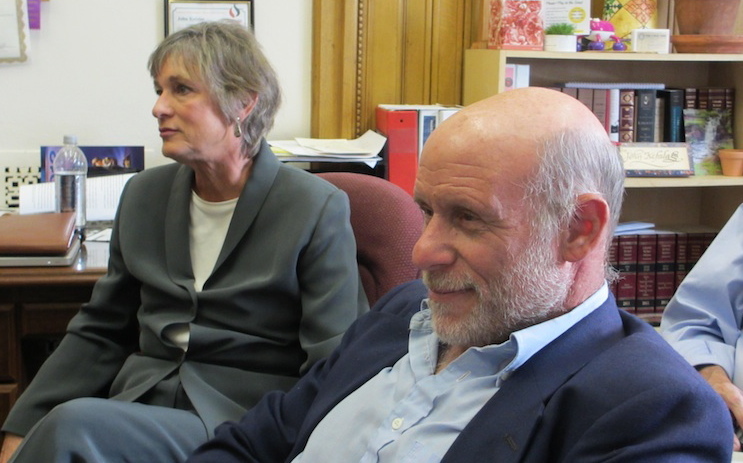 Two more years of determined work got their plan on the Boulder Faculty Assembly agenda. After lengthy consideration Eron and Hudson persuaded the Boulder Faculty Assembly to advance and recommend a variation of the plan to the UCB administration. The administration refused to follow the Faculty Assembly’s recommendation. Eron and Hudson then presented their plan to friendly Colorado state legislators and asked that it be adopted in the form of a bill that would apply to all public colleges and universities in Colorado. Recognizing that the Legislature would never vote for “tenure,” the plan was modified to allow public colleges and universities to make enforceable, five year contracts with contingent faculty. The bill failed the first year it was introduced. With a strong lobbying effort by Eron and Hudson and with the further efforts of the Colorado Conference this year, the bill passed the Legislature and Governor Hickenlooper signed it into law on April 12, 2012. Don and Suzanne also wrote the Colorado Conference’s definitive Report on the Termination of Ward Churchill that has just been published in the AAUP’s Journal of Academic Freedom. They analyzed thousands of pages of evidence and court transcripts in preparing this book length report. They found that all charges against Churchill except one are clearly refuted by the evidence. The one remaining charge can neither be proved nor disproved. Don Eron and Suzanne Hudson have provided exemplary service over a sustained period of time to further the principles of the AAUP. Their dedication has led to success both in the state legislative arena and in publically exposing efforts to suppress academic freedom for political purposes at the University of Colorado. The official presentation of the Tacey Award to Don and Suzanne will take place at the ASC business meeting in Washington, DC, at 7:00 p.m. on Friday, June 15, 2012.